Michael Gaddis, J.D. 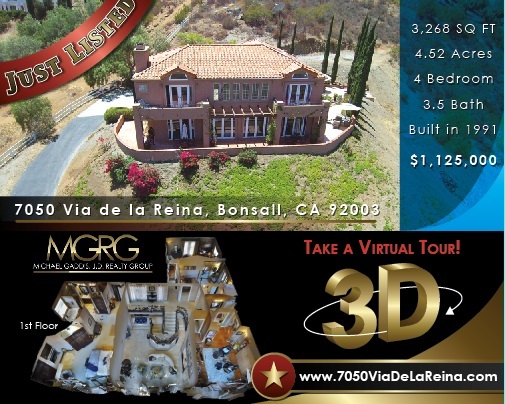 Realty Group (“MGRG”) is proud to present its newest listing located at 7050 Via De La Reina, Bonsall, CA 92003. 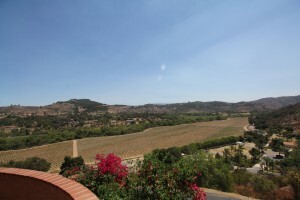 The Sellers are entertaining offers between $975,000 and $1,125,000 for this incredible 4.52 estate home in Bonsall, “The Hidden Jewel of San Diego County.” Enjoy 300 degree panoramic views of the mountains, hills, valley and vineyards below. Enjoy watching spectacular sunrises from the wrap-around lanai or numerous tiled decks. 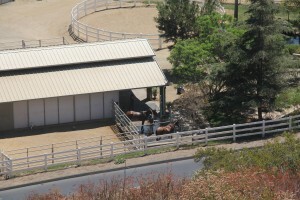 If you are an equestrian lover sit on your deck and watch beautiful horses prance and practice jumping at the horse training facility next to this property. Perhaps one of the most amazing views is when the fog rolls into the valley below created the illusion of living on an island in a sea of clouds. Bonsall is a well-kept secret that allows its residents to enjoy open country living while being located only 15-20 minutes from some of the best beaches that Southern California has to offer. 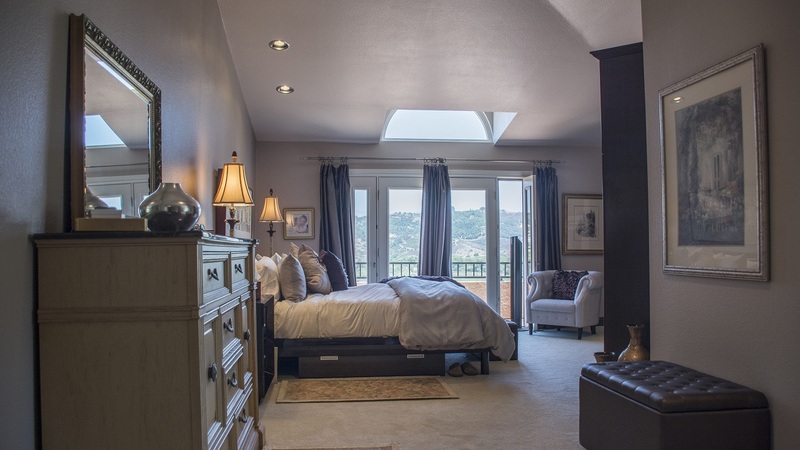 This home is a quintessential example of Bonsall perfection. From the moment that you walk through the double entry doors accented with wrought iron you will realize that this home is special. The first thing that you realize is the breath-taking views through the numerous sets of French doors of the hills, valley and vineyards below the property. 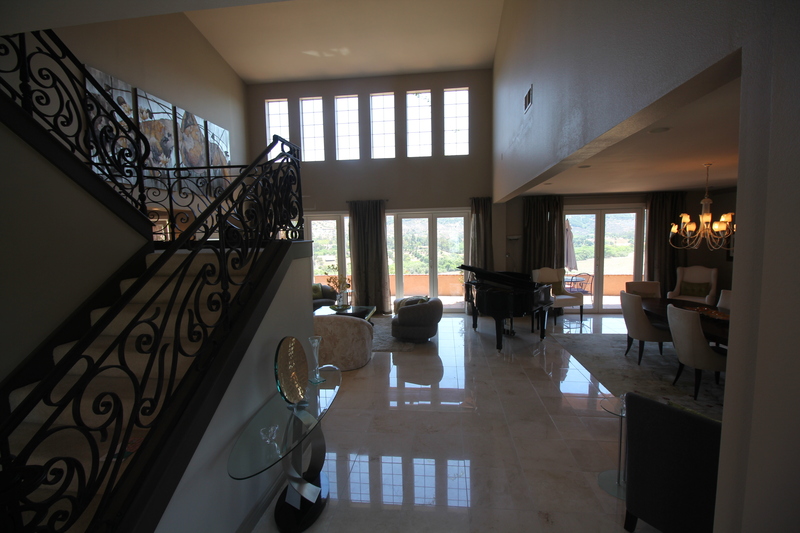 Freemont beige colored Crème Marfil Marble floors, which cover most of the first floor, give the home a luxurious feel while the Cathedral ceiling and open floor make the home feel even more spacious than its 3,268 square feet. 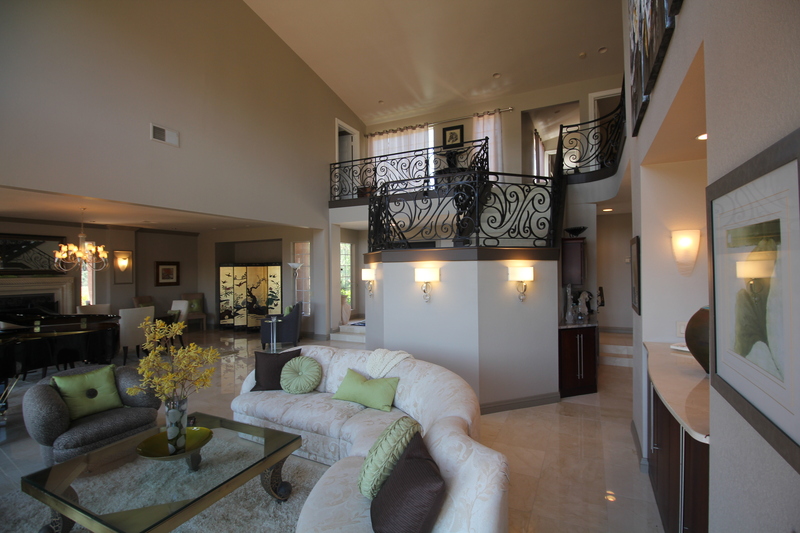 The open staircase leading to the bedroom suites located on the 2nd floor is accented by custom wrought iron work welded in place and custom lighting around its base which contribute to make the staircase the central focal point of the entire home. 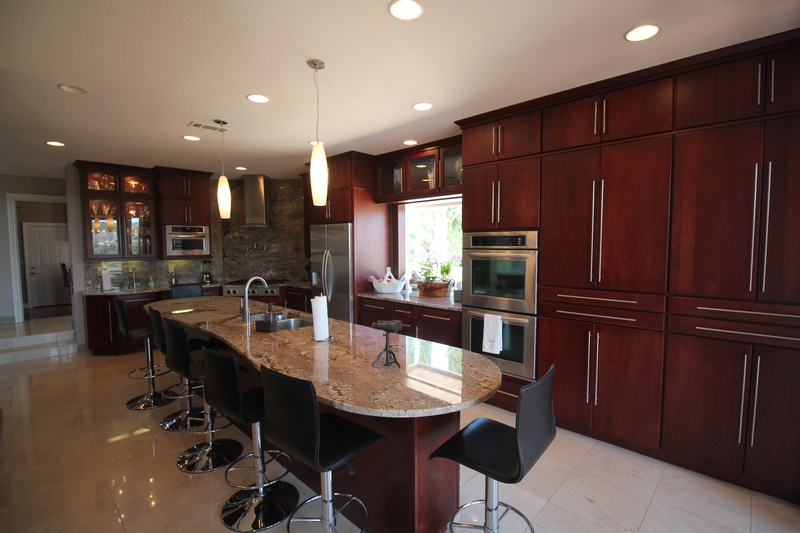 The kitchen is one of the most magnificent kitchens you will ever see highlighted by a massive center island capable of comfortably seating at least 8 people. No detail was overlooked when the kitchen was renovated. The chef of the family will love the Crème Bordeaux Granite Countertops, Blanco sinks and cherry wood cabinets with stainless steel pulls as well as the KitchenAid appliances. The counter to ceiling Crème Bordeaux Granite backsplash complete with an integrated Danze pot Filler above the 6 burner cooktop add to the elegance of this kitchen. Upgraded under island lighting and Murano Glass drop-lights over the eat-in counter accent this perfect kitchen renovation. 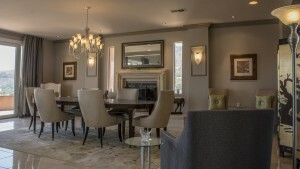 The kitchen is open to the living room and dining room, the other major living areas located on the first floor. The fireplace mantel in the dining room was custom designed by Venetian Stone in Rancho Santa Fe while the beveled glass custom windows on either side of the fireplace where created by North County Glass. 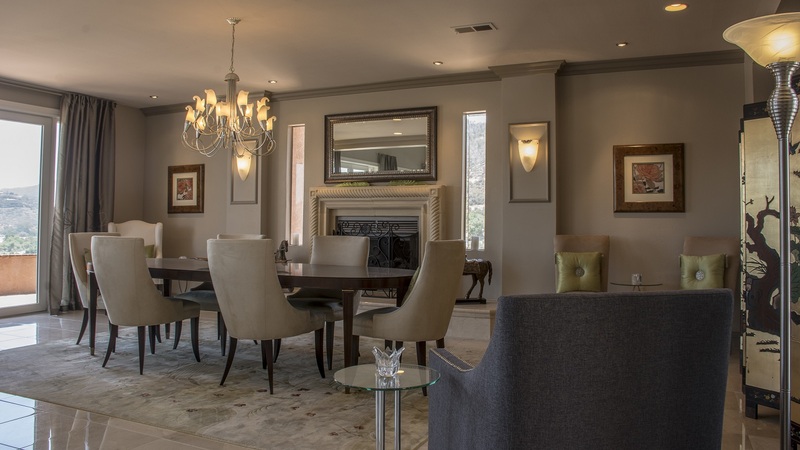 A Murano Glass Silver Leaf Chandelier made in Florence, Italy and matching sconces on either side of the fireplace add to the elegant feel of the dining room. Even the French doors mentioned above are not your typical French doors. The sellers replaced the existing 6’8” wood French doors with 8’ Active French doors with Tilt-German design and a raised header to increase the view and ventilation. 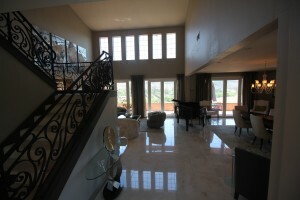 Also on the first floor is a family room. 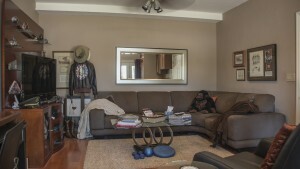 This room is a conversion of a single car garage which was completed by a general contractor. This family room is where the laundry room is located with its full-size stackable washer and dryer as well as yet another set of French Doors leading out to the courtyard complete with a built in Fireplace, a fountain and a hot tub overlooking the expansive views offered by the valley surrounding the home. The family room also comes with a unique “table under table” which can be used as a buffet table, for BBQs or assistance with laundry folding or flat drying. The family room also offers a wine refrigerator and a large sink with a disposal for post BBQ cleaning. Located downstairs is also a half-bath which has been completely renovated with Crema Marfil Marble Counters and floors, cherry wood cabinets and designer faucets, sink and light fixtures. 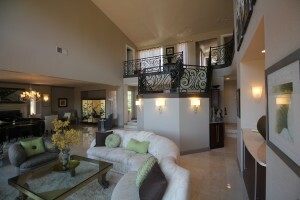 The bedrooms in this home are all very large creating a multiple master bedroom situation. 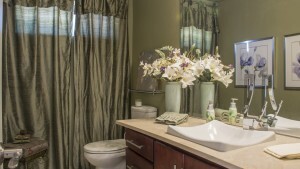 Like most of the house, the master bedroom and bathroom were completely renovated. Additional closet space and cabinetry were added, a recessed medicine cabinet was added behind the door, the bathroom was completely retiled with new sinks, faucets and mirrors added. A cedar floor was added to the closet for moth control and a wall-mounted ironing board was also installed. 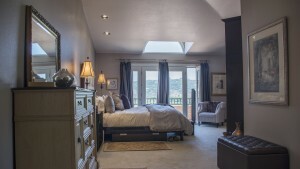 As mentioned, the other bedrooms are large and the remaining 2 baths were also updated. Some of the exterior improvements that were made include modifications to the entry where new metal double doors accented with wrought iron were added. The glass from these double doors can open to create cross-ventilation. 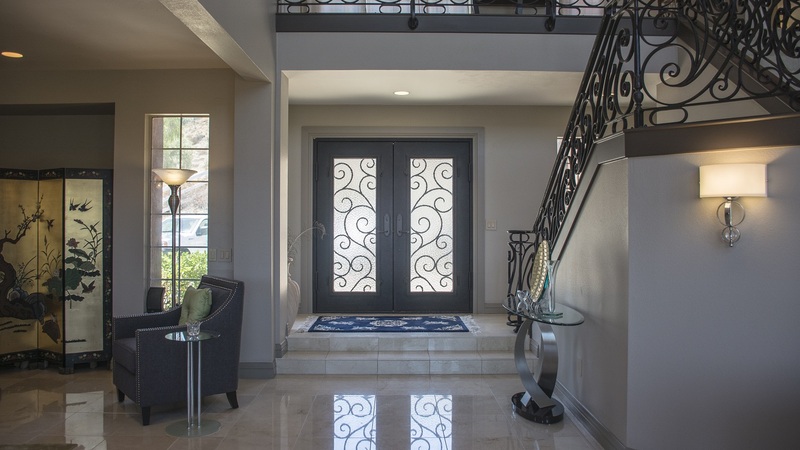 The new entryway also includes stucco pop-outs, wrought iron railings and enlarged tile stairs. There is also a new window above the entry doors and half-moon windows above the guest room and master bedroom. The home had a new air conditioner and thermostat installed in 2015. Michael Gaddis, J.D. is a Carlsbad-based real estate broker specializing in selling properties while utilizing technology. Michael Gaddis, J.D. is unique among real estate professionals in San Diego County in that in addition to being a real estate broker he is also a licensed attorney (CA, MO & KS) and a NMLS licensed mortgage broker. Michael Gaddis, J.D. also hosts a radio show “The Michael Gaddis Show” on KCBQ AM 1170 The Answer and frequently appears on the TV show “The American Dream” hosted by consumer advocate Craig Sewing. To contact Michael Gaddis, J.D. please call 760-692-5950, 760-696-1425 or email Michael@MichaelGaddis.com. Michael Gaddis, J.D. CA BRE# 01433800 MGRG CA BRE #01465493. 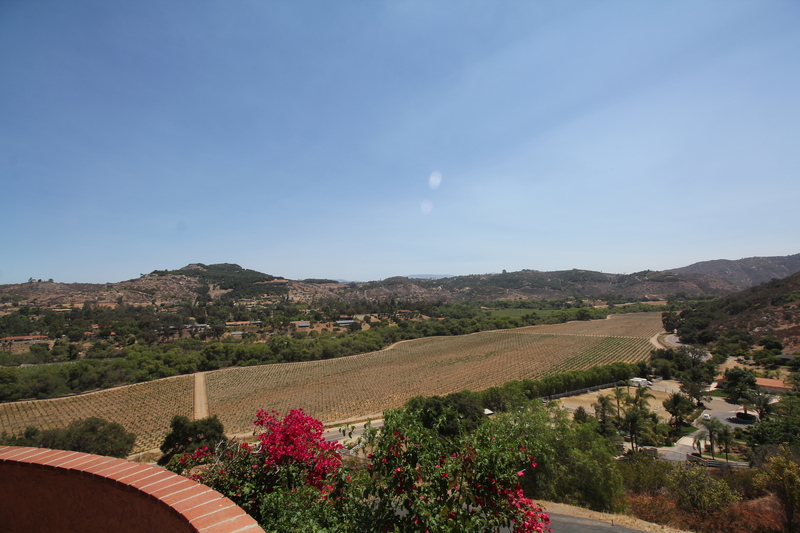 This entry was posted in Uncategorized and tagged bonsall homes for sale, Bonsall real estate, bonsall realtors, carlsbad realtor, fallbrook homes for sale, fallbrook realtors, via de la reina by Michael Gaddis. Bookmark the permalink.